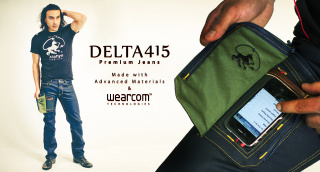 Finally an invention to help the cell phone addict with the tight jean pockets. Alphyn Industries has come out with a transparent pocket with a flap that you can cover or peel away at your convenience under the name of wearcom. Okay, so maybe this is more of a tech product than a new fashion trend. When you look at this invention and even if you don't think it's a bit bizarre, you must admit that it's a little funny. The cell phone has been progressively taking over the world, particularly the world of the young people, and that obsession has resulted in the invention of new technology and apparently new apparel to go with it. 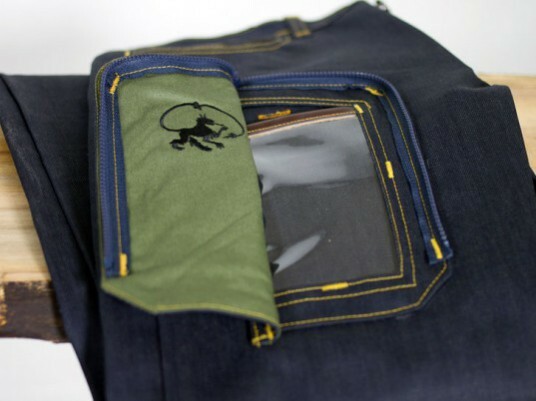 They haven't only made these special pockets for jeans but also for slacks, sweaters and even hoodies with a larger pouch made for an iPad. The pants start at a mere $85 and with the incredible convenience of using your phone without having to remove it from your pocket, how could you resist? I see many people with there phones in their back pockets or purses but why suffer the time to take it out over and over throughout the day? Most people seem more likely to have their phones in hand at most points during the day than have the phone in their pants pocket but there are plenty opportunities for this to be helpful even with the worst of addicts. If you're in a meeting (and happen to be wearing jeans) you can sit and inconspicuously text or Facebook to your heart's desire and your boss would never know that while seemingly looking down deep in thought, in reality you can beat level 27 on Angry Birds. We all know the issues with phones in movie theaters, but with this invention, you could flip open the convenient pocket flap, send that ever important message and flip it shut before anyone even knows you were the jerk breaking the rules. Cell phones and convenience go together almost as well as pizza and laziness and if this invention someday drops in price, it could really take off. Before we know it, clothes will become more and more transparent or even better, someone will invent a full body touch screen iPad. Morristown UFO: Close Encounter of the Jersey Kind?